PDF report option for Organic and AdWords research reports! Here at SEMrush, we continue to work hard to provide you with the ability to analyze data in the most convenient manner possible. Today, we've released the ability to download the following Organic and AdWords research reports into PDF format: Domain Overview, Organic Positions, Organic Position Changes, Organic Competitors, Adwords Positions, Adwords Position Changes, Adwords Competitor and Ads texts. PDFs are also available for historical data reports and the live database. Now you can quickly and easily scan any report you run and download a PDF for desktop or email use. Moreover, all of the sorting and filtering that you've applied is saved in the download. Go ahead and try it now! We hope that our hard work brings you new opportunities as we continue to bring out new features! 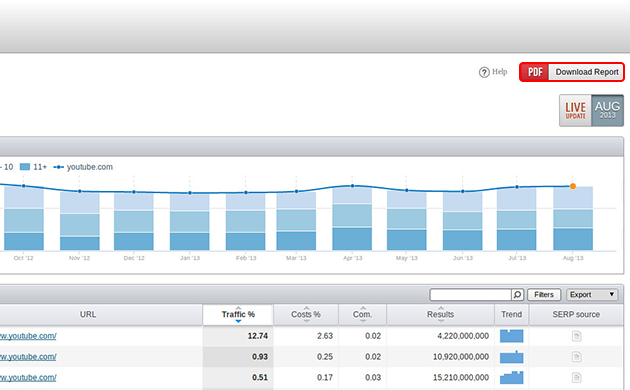 Position Changes Keywords Reports for Organic and Advertising Research Available for LIVE Database. Take Advantage Now!